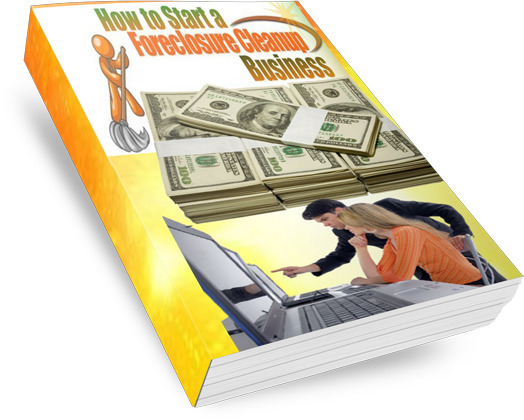 Start a SUCCESSFUL Foreclosure Cleanup Business Today! Want to Capitalize on a Hot Business Trend? A foreclosure cleanup business fits the bill. It's a lucrative business you can start almost immediately and there's plenty of work to go around -- and will be for some time to come. See Video of fast-growing Foreclosure Cleanup Company on Oprah: From 3 to 73 Employees! The great thing about a foreclosure cleaning business is that even when foreclosures aren't "hot" anymore, you'll still have a very profitable business. We'll show you how (see the marketing manual for more info). Includes FREE list of nationwide asset companies seeking subcontractors today! Don't pay extra for a list of realtors who want to work with you. Includes FREE details on where to find an UNLIMITED number of realtors specializing in foreclosures right in your own area! Includes FREE list of HUD companies looking to work with you (complete with full contact information, name, address, phone, fax, email!). Don't pay for amateur, Xeroxed reports to arrive in the mail. FREE details on writing contracts! We open our contracts to you so you see copies of actual bids! Specific breakdown on how we come up with bids, factors to consider, more! Don't buy from non-professional companies. Learn from a professionally structured company that can teach you how to setup shop and compete effectively with a professional business image. Don't buy from companies claiming to offer the same information: Get first-hand info from a PROVEN company. Buyer Beware: Our ebook comes with copyright protected, watermarked pages. And, we don't sell it via mail. It is only sold as an instant download. Many are trying to capitalize off the foreclosure trend. Foreclosure Cleanup, LLC is a bonified company actively doing business in the metro Atlanta area. This is why we can give such detailed, first-hand information. Includes FREE details on where to find an UNLIMITED number of realtors specializing in foreclosures right in your own area! Includes FREE details on nationwide asset companies seeking subcontractors today! Includes info on How to Get Business from Your Competition! There's nothing in print like it, on the Internet or in bookstores! A solid, no-nonsense, First-Hand Account of the foreclosure cleanup business. Start Part-time, with Little Money! This is a business you really can start part-time, with little start-up money. You can work it on the weekends and in the evenings until you build your business. Marketing, Contracting, Pricing, Licensing, Insurance, And So Much More is Covered! The book includes the following: Marketing Information, HUD Subcontractor Info, Start-up Sample Forms, Copies of Real Estimates, and so much more. You'll get Direction on Pricing, Niche Marketing, Working with Larger Contractors, Choosing Helpers, Licensing and Insurance info, and much, much more. 200 Pages of Information! Peek at Some Real, Live Jobs! Plus, you'll get a look at several jobs won and completed with a step-by-step account of how each job unfolded! All information is the first-hand account of an existing foreclosure cleanup business. We've packaged our business experience for you so you can hit the ground running!